The smell of the campfire, a starlit sky, tents nestled in between the trees and crickets chirping softly. These are the sights, sounds and scents of a night of camping. A perfect activity for families in the summer, camping is something that children often cherish for the rest of their lives. To make the most of your camping experience, plan some fun activities to enjoy while you’re out in nature! While many parks offer trails, swimming and more, there will inevitably be some down time at the campsite that may result in your little ones saying “I’m bored!” Create wonderful family memories with these simple camping activities for kids, most of which don’t require much extra planning. Simply bring your imagination and sense of adventure! Older children can even use phone cameras to document more difficult nature scavenger hunt items such as birds, squirrels, spider webs, insects and more! These more tech savvy children can upload their images to Picniic for the whole family to see and create Picniic lists to keep track of the scavenger hunt items. Any way you choose to do it will result in exploration and fun in nature! 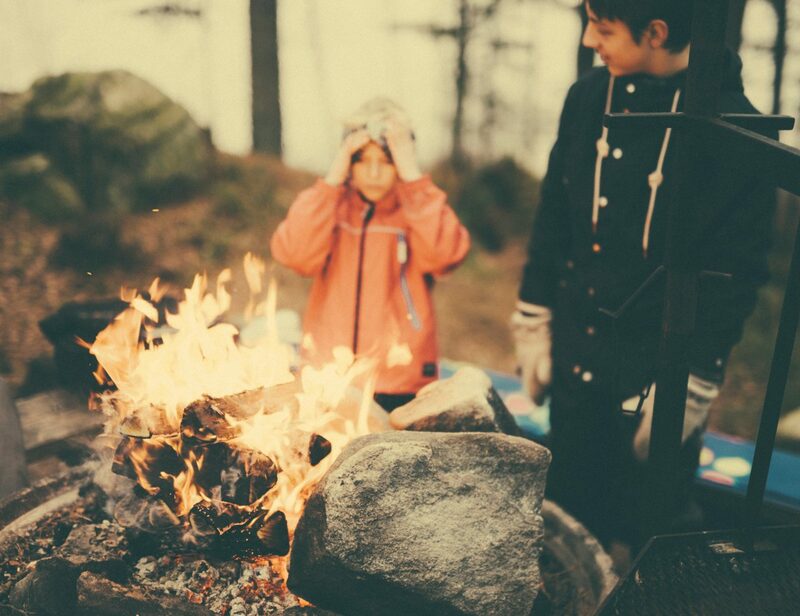 Make mealtime fun by involving your kids in campfire cooking. Rather than using a propane stove or pots and pans, get your kids on board for some old-fashioned cooking over the open fire. What are some good choices? Roasting hot dogs is an excellent choice. Another option is to have your kids help prepare foil wrap meals. For this meal, wrap up cabbage, sliced potatoes and carrots with a meat patty (optional) and a dab of butter, salt and pepper in aluminum foil. Then toss the packages right onto the coals and cook until done, turning occasionally. Finish off your meal with the classic camping dessert: s’mores! Just remember when cooking around the campfire to supervise your children carefully. It’s a fun experience, but children must be closely monitored to avoid burns. Take advantage of time around the campfire for storytelling. In addition to making up stories, you can tell children stories about what they were like as babies or stories from your own childhood. Alternatively, use storytelling games, of which there are plenty to try. For example, you can pass the story around the family. One person begins the story and passes it on to the next person to continue. The catch is that each person can only add one sentence to the story at a time! Lacking inspiration? You can also bring along some mad libs. Mad libs can easily be found online and always result in very silly stories. Print a few out just in case you need a fun storytelling activity. Geocaching is a fun outdoor activity that involves finding hidden treasures using GPS and maps. If you happen to go to a place where you can find an official geocache spot, that’s great! You can use the website and instructions to find the geocache. But what is a geocache? Usually, it’s a fairly small, waterproof container in which a visitor’s log and small trinkets are hidden. It can really be anything! Remember to bring your spirit of adventure and a small trinket to exchange if you’d like. You’ll also need a pen to sign the log. However, if there isn’t a geocache in the area, you can make one! This can be a fun split activity, in which the family breaks into two groups. Each team must plan, make and hide a geocache for the other team to find. Using a GPS enabled smartphone, each team should mark down the coordinates where they hide the geocache. Then, exchange coordinates and attempt to find the other team’s hidden geocache. It makes for a very exciting treasure hunt! Invite your kids to get creative and make a map of your campsite. Older children can include elements like a key, while younger children can simply draw a bird’s eye view of the campsite. These maps will serve as perfect souvenirs from your trip! Get creative with twigs, moss, leaves and flowers building a fair house! You could even build a whole village. Show your child how to use items from nature to create a small house for a fairy or a gnome. Choose an out of the way space to create your house or village such as at the base of a tree. Then, encourage your child’s creativity to create a miniature house or landscape perfect for a fairy. Use mud as your mortar, sticks, pebbles and anything else you can find as you build. When you’re done, don’t forget to take a picture! A rainstorm could quickly destroy your work, so you’ll want a memory of your creation. Upload the photo to Picniic for easy storage that gives the whole family access to the picture. Take along a few of these ideas for your upcoming camping trip! You and your children are sure to enjoy the adventures and fun that each activity offers. Do you have a favorite camping activity? Tell us about it in the comments below!